Two primary species of bunch grapes are commercially grown in the United States: the European bunch grape (Vitis vinifera) and the American bunch grape (V. labrusca). South Carolina’s climate is not well-suited to home garden production of European bunch grapes, but some American bunch grapes and hybrids between the two species grow well in South Carolina. If they are well-cared for and sprayed when diseases and insects threaten, you can expect yields of 20 to 30 pounds of fruit per vine. ‘Mars’ is an excellent seedless grape for fresh consumption. Soil & Site: In the South Carolina mountains and Piedmont, a late spring frost can reduce yields significantly, so plant bunch grapes on elevated sites. In all areas, avoid low spots where cold air settles. The site should be in full sun most or all of the day. Well-drained loam or clay loam soils are best. Bunch grapes also grow well on heavier clay soils; however, excessive vine growth and delayed maturity may result. Avoid areas where water stands after heavy rains. Trellis Systems: The grapevine does not have a rigid trunk; therefore, some support structure, usually a trellis, must be provided. The trellis design should maximize light penetration inside the canopy, exposing the buds, leaves and fruit clusters, especially in the latter part of the growing season, to as much sunlight as possible. Selecting the right trellis system depends primarily on the type of grape. Although several trellis systems are available, there is no single system that is appropriate for all bunch grapes in all situations. South Carolina gardeners should consider low- and high-trellis cordon systems. The low-trellis cordon system establishes the cordons 3 to 3½ feet above the ground and includes two to three catch wires positioned at 10-inch intervals above the cordon wire. This system promotes vertical growth, resulting in a narrow, upright vertical canopy that speeds up the drying of leaves and fruit, which helps to reduce disease outbreaks. French hybrid and Vitis vinifera grape cultivars should be trained to a low-trellis cordon. The high-trellis cordon system establishes the cordons 5 to 6½ feet above the ground. Grape cultivars suited to the high trellis are very vigorous and have a trailing growth habit. For American (“non-labrusca”) and American hybrid grapes, establish the cordons at the lower limit of the high-trellis cordon system, about 5 feet above the ground. Trellis Construction: To simplify installation and to avoid damaging the young vines, build and erect the trellis system before the vines are planted. Construct the trellis with pressure-treated wood to resist decay or a durable type of wood such as cedar or locust. Use 11 to 12.5 gauge high-tensile galvanized steel wire and wire strainers to maintain wire tension. Space vines 8 feet apart in the row and space rows 10 feet apart. Plant the first and last vine 4 feet in from the end posts, and set line posts at 20- to 30- foot intervals down the row (about three vines between line posts). Purchasing Plants: Bunch and French hybrid grapes, unlike muscadines, do not require cross-pollination. Therefore, it is not necessary to buy two or more cultivars for pollination. However, several cultivars can extend the harvest season. Variety Selection: Many varieties of bunch grapes will perform well in the mountains and Piedmont. Also, certain selections of French hybrid grapes (wine grapes) are suggested for trial in these areas. Several new hybrid bunch grapes are worthy of trial in the sandhills and coastal plain. All of these have good resistance to Pierce’s Disease, the primary limiting factor to bunch grape culture in these areas. Varieties suggested for the mountains and Piedmont include: ‘Aurora,’ ‘Chancellor,’ ‘Vidal ‘ and ‘Villard Blanc’ for white wine; ‘Baco Noir’ and ‘Foch’ for red wine; ‘ Interlaken,’ ‘Mars,’ ‘Reliance’ and ‘Saturn’ for fresh eating; ‘Concord, ‘ ‘Delaware’ and ‘Catawba’ for both fresh consumption and wine production. Varieties suggested for the sandhills and coastal plains include: ‘Blanc Du Bois’ and ‘Lake Emerald ‘ for white wine; ‘Roucaneuf’ and ‘Black Spanish’ for red wine; ‘Daytona’ and ‘Orlando seedless’ for fresh eating; and ‘Conquistador’ for both fresh consumption and wine production. Planting the Vine: Plant grapevines in late winter and early spring. Vigorous 1-year-old plants are best. Keep the roots moist until planting to prevent them from drying out. Pack the roots in moist, but not wet, sawdust or sphagnum moss and wrap the tops in polyethylene. Store the vines in the refrigerator until they can be planted. Planting will be easier if the soil is spaded or tilled beforehand. Dig a large enough hole to let the roots spread out naturally (root pruning is not recommended except to remove damaged roots). Plant the vines at the same depth or slightly deeper than they grew in the nursery. Keep the topsoil separate to place over and around the roots. Do not place fresh manure or fertilizer in the hole. Tamp the soil firmly around the roots and water immediately afterwards until the root zone is thoroughly soaked. After setting the vine, prune it to one stem and cut this stem back to two or three buds. ‘Saturn’ is a cultivar with larger fruit, each of which only contains two seeds. It is used primarily for fresh consumption. Fertilization: Establishment of proper fertility levels before planting helps get the young vines off to a good start. Grapes prefer a soil pH of 5.8 to 6.5. Test soil through the Clemson Extension Service prior to planting. After plants have been settled by a drenching rain and before growth starts, apply ¼ cup of 10-10-10 fertilizer around each plant. Keep the fertilizer at least 6 inches from the vine. Repeat at six-week intervals until mid-July. On 2-year-old vines, double the first year rate and use the same intervals. Bearing vines will need 2½ pounds of 10-10-10 per plant applied in March. If growth is poor on producing vines, apply 1 pounds of 10-10-10 per plant in May. Foliar magnesium deficiency may become noticeable in midsummer. This deficiency is characterized by a yellowing between the leaf veins on the older grape leaves. If the soil pH is sufficiently low to warrant liming, use dolomitic lime to help prevent magnesium deficiency in future years. Otherwise, magnesium sulfate (Epsom salts) should be applied and watered in. For young plants, apply 2 ounces around each vine, keeping the salts away from the trunk 6 or more inches. Apply 4 to 8 ounces per mature bearing vine. It may require two to three years of magnesium application to bring the level up for the best plant performance. Weed Control: For at least the first two years, keep an area 1 to 2 feet in diameter around each vine free of weeds by hoeing or mulching with compost. Once established, the vine will shade out and suppress some weeds. Recommended chemical herbicides may also be used for weed control in grapes, but mulching is the preferred management practice. Do not use the combination of fertilizer plus weed killer on lawn areas near a grapevine because the weed killer may be picked up by the grape roots and cause vine injury. Growth & Fruiting Habit: Grape clusters form on the current season’s shoot. These shoots, on which clusters are borne, developed from buds formed on last year’s growth (1-year-old wood), which is pruned back to spurs or short canes. Shoots more than a year old are nonproductive and should be pruned. Canes, which are small in diameter, are not as productive as those of pencil size (1/4 inch diameter). Also, thick, slightly flattened canes with widely spaced internodes (bull canes) are typically non-fruitful. As with small canes (less than 1/4 inch in diameter), bull canes should be thinned out or headed back to one bud. First Year: During the first season, the primary objective for grapevine growth is the development of a large, healthy root system and a straight trunk. When new growth begins, train the two or three shoots that arise from buds on the pruned cane to a training stake. This 4- to 5-foot stake should be set 10 to 12 inches deep and should be long enough to be tied to the first wire of the trellis system. Tie the shoots loosely to the stake several times during the growing season to maintain vertical growth. On each shoot pinch back any laterals to a leaf to encourage rapid extension growth. Keep the vines well-watered and mulched to suppress weeds. Second Year: In late winter evaluate the amount of growth produced during the first year. If no cane is long enough to reach the cordon wire, remove all but one. Prune this cane back to two buds and treat it as a first- year vine. If a cane is long enough to reach the cordon wire, relatively straight and of adequate pencil-size diameter (about ¼ inch), retain it as a trunk and remove the rest. Cut this trunk-cane through the first node above the cordon wire and tie it to the support stake. When new growth emerges in the spring, select two shoots that are 8 to 12 inches below the cordon wire and on opposite sides of the trunk. Remove all other shoots. When these shoots reach 1½ to 2 feet in length, gently bend them over to the cordon wire and loosely tie them. As these cordon shoots continue to grow, loosely twine them around the wire (do not wrap a shoot more than three times around a wire) and tie them. To avoid damaging the tender shoot, tie the cordon shoot at least 12 to 18 inches from the tip. When the cordon shoots have grown 5 to 5½ feet from the trunk (1 to 1½ feet beyond the halfway point to an adjacent vine), cut them back to 4 feet from the trunk, which encourages lateral shoot growth. Low-trellis cordon system: Remove lateral shoots that develop on the underside of the cordon and retain the shoots that develop on the upper side. High-trellis: For American labrusca bunch grapes, remove shoots that develop on the upper side of the cordon and keep the shoots that develop on the underside. For American non-labrusca and American hybrid bunch grapes, prune out shoots that develop on the underside of the cordon and retain shoots that develop on the upper side. With either system, rub off all flower/fruit clusters as they develop and maintain a good pest control program to protect the leaves. Third Year: The objective of the third growing season training is to establish vertical arms on each cordon. Low-trellis: In late winter, head back canes that developed on the upper side of the cordon to spurs of one to three buds. Space the spurs at regular intervals of 4 to 6 inches. Remove all extra shoots and suckers arising from the trunk. When new growth begins, rub off any shoots that develop on the underside of the cordons. Tie the selected vertical shoots to the first catch wire as soon as they reach a length of 18 inches. The sole purpose of the catch wire is to direct the shoots upward. Later in the growing season, head back or hedge the shoots above the top catch wire. Ideally, these shoots should be 4½ to 5 feet long with 15 to 20 leaves. High-trellis: For American labrusca bunch grapes, retain short canes of four to six buds on the lower sides of the cordons to promote downward growth. Space them at regular intervals of 4 to 6 inches along the cordon. For American non-labrusca and American hybrid bunch grapes, retain spurs of one to three buds or short canes of four to six buds on the upper sides of the cordons. Train the shoots downward to create a “curtain.” Altering the canopy in this manner will improve light interception by the leaves, and most important, will expose the basal four to five buds of the shoots to sunlight. These are the buds that will produce next year’s crop, and the exposure to light will increase their fruitfulness. During the third season, it is very important to prevent the vines from overproducing. Allow only one cluster of fruit per two shoots to balance fruit production with the accumulation of food reserves in the vine. Continue to maintain a good pest control program. The first step is pruning last season’s growth. Evaluate the canes that developed from last year’s spurs. Select straight canes, that developed from basal spur buds (closest to the cordon) and are growing in the right direction for the particular training system. Head back these canes to spurs or short canes as was described in the third year for each system. They should be spaced 4 to 6 inches apart along the cordon. The second step is to remove water sprouts, suckers, and any tendrils attached to the trunk or cordons. Finally, prune back cordon growth beyond the 4- foot point or halfway to the next vine. Do not retain any canes on the bends or divide of the cordons. For both the low- and high-cordon systems, maintain four to six shoots per foot of cordon, removing shoots where necessary. Also, selectively remove leaves from around the fruit clusters to improve fruit quality and help reduce disease pressure. These leaves can be removed shortly after bloom but before the berries begin to change color and soften (the verasion stage). 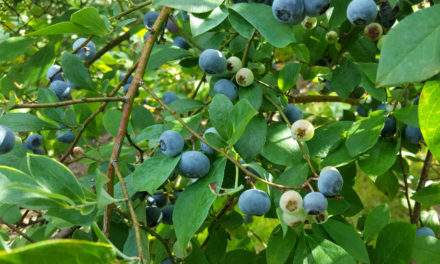 Do not remove the leaves after the berries begin to soften because sunburn may result. Over-cropping will greatly reduce fruit quality and will reduce next year’s harvest by limiting food reserves in the vine. Some cluster thinning in years of heavy fruit set (thinning to one or two clusters per shoot) is the simplest way to ensure that those remaining fruits will develop into larger, more fully ripened clusters. A good rule-of-thumb for mature vines is to allow no more than two clusters per shoot. An acceptable taste is the main criterion for table use. On a vine that is not over-cropped, the berries of black varieties lose their red color and white varieties will change from green to golden yellow. Ripe berries will soften and seeds become brown. Determining the harvest of wine grapes requires either experience or a means of measuring both sugar and acid content. Since bunch grapes are susceptible to a number of diseases and are attacked by several insect pests, a season-long spray program may be necessary to produce good fruit. Pierce’s disease, which is very common in the sandhills and coastal plain, is a bacteria-like disease spread by leafhoppers that kills susceptible bunch grape varieties. Special varieties should be grown in the sandhills and coastal plain for the vineyard to live for more than three years. Pierce’s disease symptoms on ‘Jupiter’ grape foliage. This disease is spread by leafhoppers and primarily occurs below 1800 feet elevation. Downy mildew is a fungal disease, which causes yellow spots on upper leaf surfaces and white, cottony growth on the undersides of the spots. Black rot is a fungal disease, which causes brown leaf spots with dark borders and black, shriveled grapes, which remain attached to the stem. An important insect pest that deserves special attention is the grape root borer. It is very difficult to control and can destroy entire vineyards. The adult grape root borer is a moth that resembles a wasp. From July through October it can be found flying and laying eggs on grape leaves. Larvae drop from eggs down to the soil where they begin feeding on the small feeder roots, and eventually move into the crown of the grapevine during its two-year larval stage. Infested vines lose vigor and usually die. Larvae pupate just below the soil surface and adults emerge from the soil directly beneath the grapevine from July through October. Cultural control measures include mounding soil directly beneath the vines in late June or very early July to prevent adult emergence. A landscape fabric (geotextile weed barrier) may be an alternative to mounding soil. These materials are porous and will allow water penetration, but the weave is too tight for adults to pass through. While these cultural controls can eliminate the adults, they offer no control of moths flying into the vineyard and laying eggs on the leaves. The larvae may be able to reach the roots through the landscape fabric.